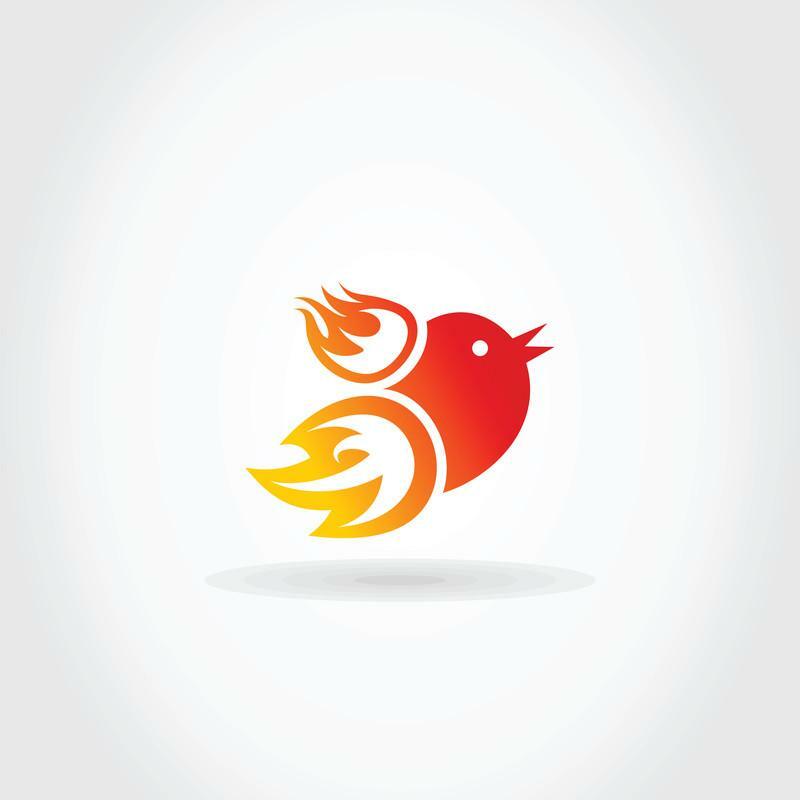 According to Twitter, tweets with images average a 35 percent boost in retweets. If you look at your Twitter analytics, you’ll see that photos typically result in more action (as in clicking through to a link). So it makes sense to use some eye-catching images in your tweets. It’s important to note that there are optimal dimensions for images on Twitter. In-stream photos work best when the dimensions are 2:1. This useful post from Sprout Social gives more detail that will help you get the most out of images that you share on Twitter and other networks. So what’s someone to do when they’re not an artist and don’t have all day to take photos or draw fun pictures to share? The answer is simple – find the right tools. There are a few tools that I use on a regular basis to improve the quality of my tweets. All of these tools are free and are user friendly. They save time and add value. Canva has you covered for any type of image on most all social networks. There are templates in its dashboard so that you’ll know you have the best dimensions for whichever network you’re targeting. You can also specify custom dimensions if you’re inclined to create something like a brochure or flyer for print. 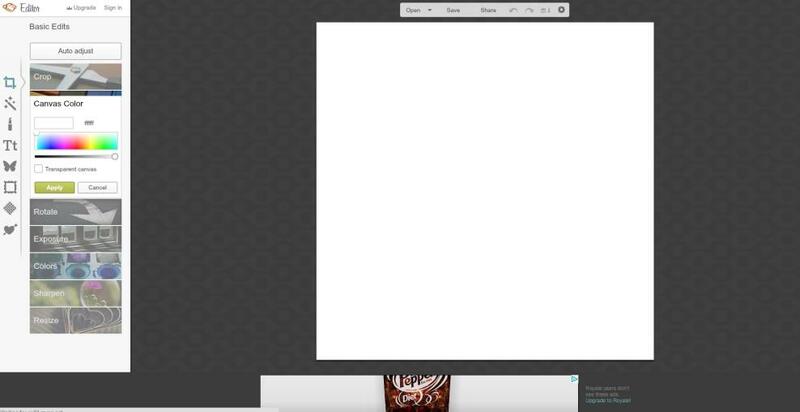 To create a Twitter optimized image, select the “Twitter Post” template from the dashboard. Once inside the Twitter Post dashboard, you can select from a plethora of images, backgrounds, stickers, etc. You can even upload your own photos to add into your image. Note that while many of the options here are free, there are some that have associated costs of $1.00 per component. You’ll see this when you hover over the item. You can easily add and customize text to the size and font you like. Once you have the image just the way you want it, you can download it using the button in the top right of the screen. You can also choose whether to keep the image private or make it public for others to see (here’s an example showing some of my personal images that I’ve made public). The only downside to Canva is that it does not yet have a mobile app. It can, however, be used via a smartphone browser, but it’s much easier to use from a computer. 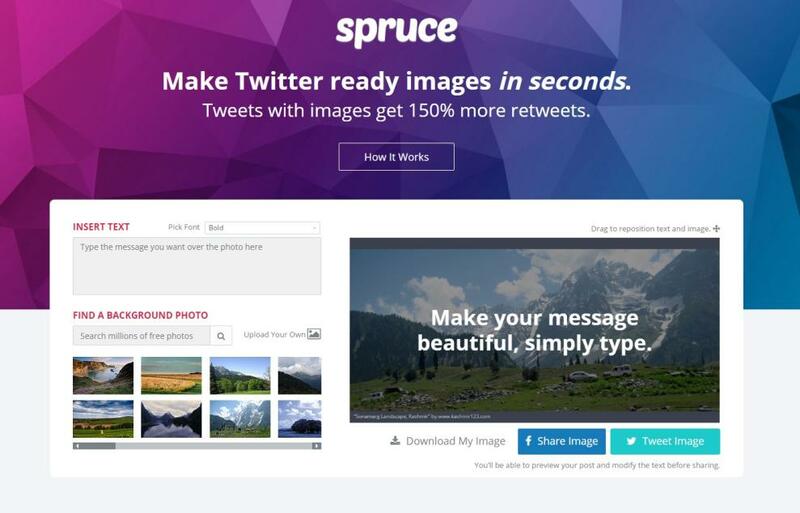 Spruce is a lightning fast option for creating images for Twitter. Note that the dimensions of the images are optimized for Twitter. You can easily share an image directly from the website to Twitter and/or Facebook, or you can download your image to your computer and upload it to social media wherever you like. One advantage with Spruce is that they have a library of photos with proper attribution that you can use freely. So you’ll notice attribution is in small type near the bottom of the photo. So you don’t have to scour the internet or your computer looking for pretty backgrounds to use. On the other hand, if you do have an image you’d like to use, you can upload your own. You can customize your font to a certain extent (even though the options are left simple), keeping the whole process of creating a shareable image very fast. Spruce is available via browser only, but there’s no cost and it’s a great option for creating something on the fly. PicMonkey has a lot of options for creating or editing images. While it doesn’t have a pre-loaded template for Twitter images, you can use the custom dimensions option and set your dimensions to 506 X 253, and you’ll be good to go. You can fully customize your text, background, and more. There are some frames you can add, and if you’re using an uploaded image, there are even some options for editing and making corrections to photos. While there is a free version of PicMonkey, it is supported by ads. The PicMonkey tool is also a bit more complex to use than the others and is browser based only. But it’s a great option if you have something very specific you’d like to accomplish and you have a few minutes to invest. Also, there are a few browser plugins that can be useful for creating images outside PicMonkey’s dashboard. PicLab is a great option for when you’re on your smartphone and don’t have access to a computer. It’s available for iPhone, Android, and Windows. The basic version is free with other versions and add-ons that have associated costs. In the free version of PicLab, you can take an image from your phone and turn it into a shareable graphic. With the free version, there will be a small PicLab watermark on your finished product, but it is small and in the bottom corner of the image. PicLab allows for a good amount of customization with backgrounds, fonts, etc. It’s simple to use and can help you render an image quickly. You can share images directly to your social networks or you can download them to your phone. 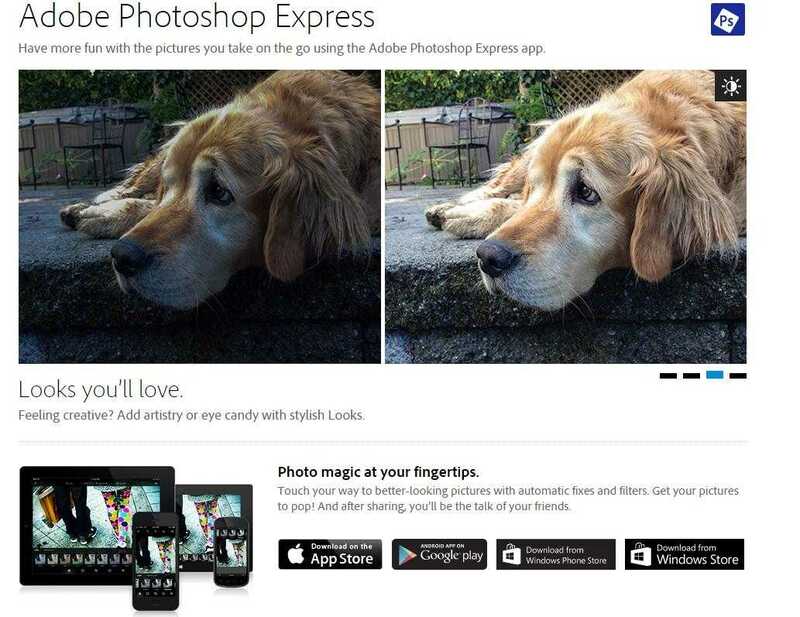 Adobe’s Photoshop Express app is available for all smartphones, and it is free. There are some additional filtering options that require in-app purchases, but you can achieve quite a bit without spending any money. One of the best features of this free app is that it has sophisticated but simple to use filtering options. You can drastically increase a photo’s exposure, temperature, and more with just a few clicks. You can also flip and rotate images easily. The cropping tool has templates for images sizes. While there’s not one specifically for Twitter, the 6 X 4 option works well. There are quite a few pre-set filters you can apply using the free version of the app. You can also add frames. Unlike the other tools listed, Photoshop Express is really designed for photo editing, so it does not allow for adding text to images. On the other hand, it is great for cleaning up messy or poorly exposed photos for sharing on social networks. Images can be saved to your phone or uploaded directly to the network of your choice. Do you incorporate images with your tweets? What are your must-have tools for creating them? We’d love to hear from you. Drop us a comment or tweet us at @BayLeafDigital or @ChristinKardos.